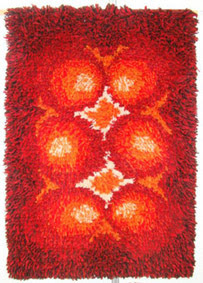 Rya Rugs are woven or sewn woollen long piIe textiles. They were commonly made and used in all over Scandinavia and Nordic Countries where, in old times, they worked as covers to sleep under or keep one warm in horse pulled sleighs on the wintery church trips, etc. 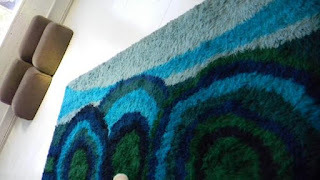 The history books tell that the Viking soldiers, on their sea journeys, wore Rya Rugs instead of animal skins as the airy rug was lightweight and kept them warm even when a swollen sea soaked them with salty water. 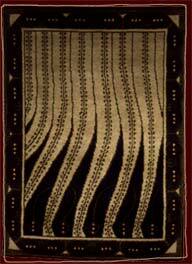 In Finland in 18th century, a Rya Rug was often used as a prayer rug during wedding ceremonies. After the wedding the textile was hung for display in the couple's home. The different pattern and colour designs used to be specific to the event and the plants that were available locally for dying the wool. 20th century Rya Rugs are often works of art designed by textile artists and painters such as Finnish Akseli Gallen-Kallela who designed the famous Liekki (Flame) wall decor. 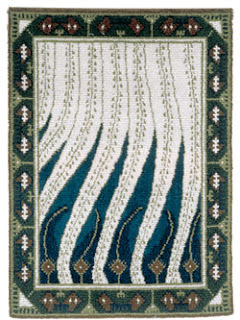 They are mainly used in homes but also in churches and other public places. 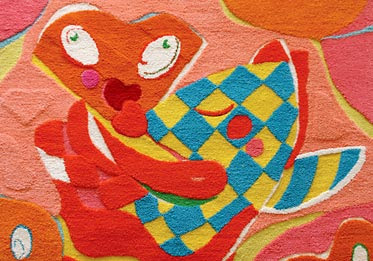 They're great interior decoration textiles both on walls and floors as they absorb voices and sounds very well and prevent echoing so. 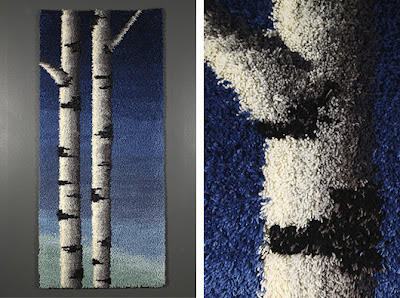 Throughout the years the Rya Rugs have followed current interior decoration trends. 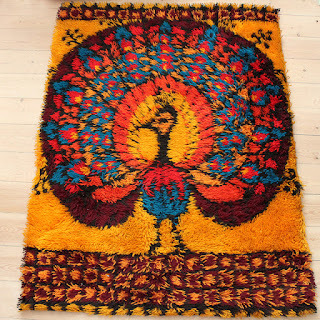 In 1970's the designs were very colour rich and bold. 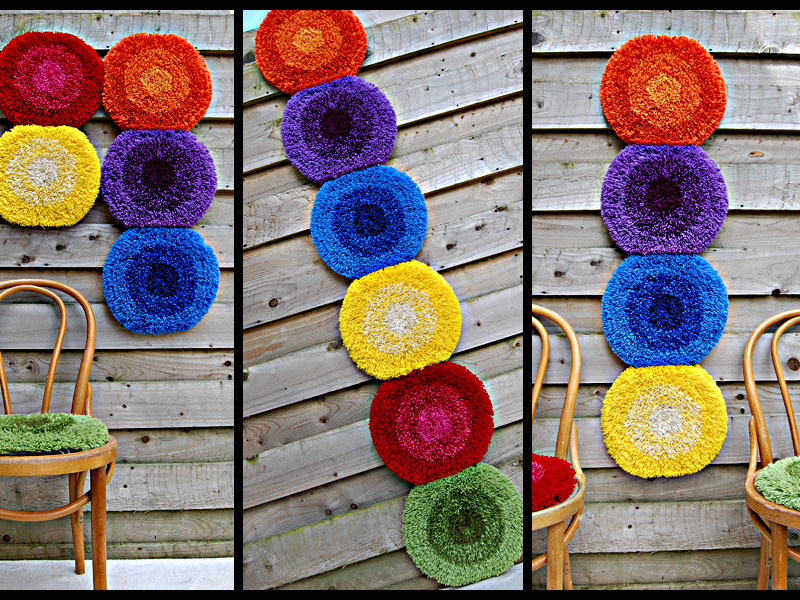 and Heli MG's multifunctional 'Multivitamin' wall decor! 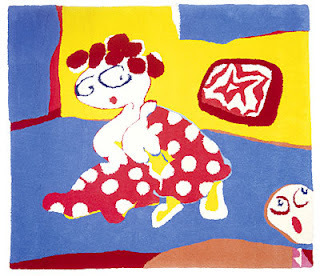 Both 70's retro rugs and 21st century's fresh colour dots inspire my own life and work most. They make energizing combos with neutrally toned rooms and furniture with simple lines. Same idea works in my fashion collections; the fashion pieces are playgrounds of neutrals with a drop of colour. 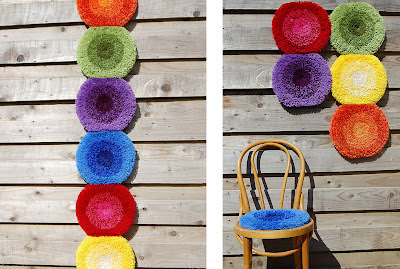 What a great colours in Multivitamins and Riitta Nelimarkka`s designs! Thanks for comments ladies! I agree, today's versions are nicest and freshest. In 70's the colour combos were sometimes a bit dark & 'dirty'. Also in the beginning of 20th century the yarns were dyed with plant colours with which you can only achieve earthy tones, nothing very bright.